The post-apocalyptic landscape of The Walking Dead, television's most popular show about zombies, may not seem like the ideal place to put your product. However, Hyundai's unconventional decision to integrate their product with the show may be proof that their executives are really using their braaaaaains (see what we did there?). So far Hyundai has linked their brand to the show with exceptional product placement, sweepstakes, commercials and even a zombie themed app. All of this is helping Hyundai convey a cool, youthful brand image to the 17.3 million viewers that tuned in to watch the show's fifth season premiere October 12. They even won the Word of Mouth Marketing Association's Driving Engagement Award earlier this year. You may be wondering why the Hyundai/Walking Dead pairing works so well. Luckily, we have answers. The marketing tactics working in their partnership are the same things that can make your dealership's marketing successful. 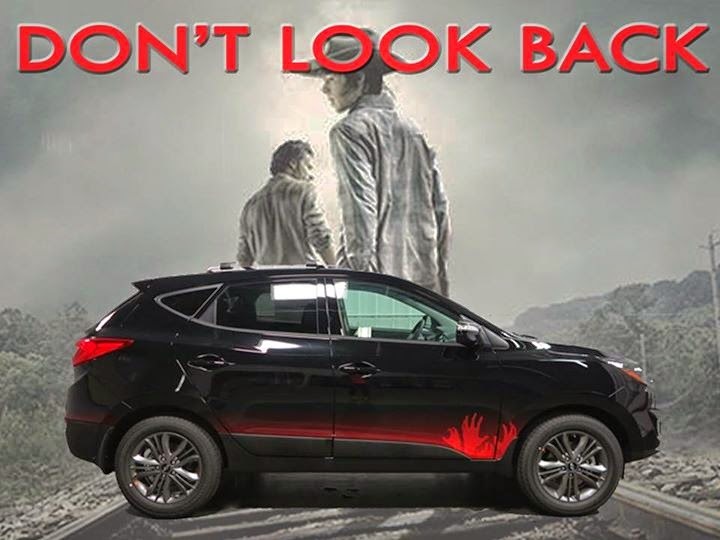 Capitalizing on the hype created by their integration with The Walking Dead, Hyundai developed a custom, limited edition Tucson. The car will help form an even deeper connection with fans and remind them of the show. Plus, the ride looks sicker than someone who's been bitten. Customization helps shoppers make a more personal connection with a product or business. For instance, creating a custom phone greeting is one way your dealership can forge a deeper connection. Unique welcome messages provide additional information about ongoing deals and allow conversations to start out on the right foot. This provides your employees with an immediate advantage when they pick up the phone. It isn't an accident that the green Hyundai Tucson used by the survivors on The Walking Dead always seems to be pristine. The agreement Hyundai has with the show specifies that the car can't mow down zombies or otherwise act like a tank. As a result, the survivor's Hyundai has been given a hero role: It's the trusted, clean and dependable vehicle someone uses to make a quick escape. Much like Hyundai, your dealership needs to make rules that work in your favor. Compliance with the Do Not Call (DNC) list is extremely important; you don't want to contact people who would rather not talk to you, and fines for violations can become expensive. Make sure you use a DNC compliance tool while making calls to potential customers. It will help keep you compliant with the registry so you aren't slapped with any big fines. Hyundai has been accepted into the fold because it seeks to communicate with viewers in the right way; their messages are spirited, fun and, above all, not overbearing. As a sign of the fans' love for Hyundai and the green Tucson featured on the show, a parody twitter account for the car has even been created. When building a relationship with customers, your dealership should focus on developing great communication skills as well. One way to make sure employees are treating customers right is through the use of a call recording system. Being able to record and review calls allows you to catch and correct any mistakes quickly so they won't plague the dealership. For more information on building a strong bond with potential customers like Hyundai has, make sure to take a look at these five tips. Advertising has changed a lot over the past several decades, but one method that dealerships aren’t showing any signs of abandoning is the use of mascots. Why? Because, let’s face it, car buying can be intimidating. When consumers associate, say, a cute dog mascot with the dealership instead of a stereotypical (and unfortunate) image of an unethical salesperson, the dealership instantly becomes more approachable. Let’s take a look at three notable examples of mascots done right. With the slogan "A nice place to do business," Conicelli Auto Group in Pennsylvania actively combats the idea that the dealership is out to cheat its customers. But a few years ago, the dealership decided it wanted more than just the catch phrase and began brainstorming ideas for a mascot. After shooting down the idea of a stunt squirrel, Conicelli settled on a caricature of Mr. Nice Guy himself: the dealership's now-retired founder, Dom Conicelli. Now, Mr. Nice Guy is seen all around town, thanks to the dealership's "I Spy Mr. Nice Guy" contests, in which customers place a Mr. Nice Guy magnet on the backs of their cars. Whenever a Conicelli employee spots a magnet, the customers wins an instant prize, which is usually a gift card or prize pack and an entry into a drawing for a grand prize. Bill MacDonald didn't have to look hard to find a mascot for his Ford dealership in St. Clair, MI. The mascot, as it turns out, was right in Bill's backyard — literally. He’s Bill's very own fluffy white dog, Max. With his charm and flowing locks, Max is the perfect candidate for Bill MacDonald Ford's commercials. He even stars in his own cartoon! Bill has found that Max is also one of the best traffic drivers he has. He brings Max to work with him in the morning, and people flock to the dealership to meet him. In fact, Bill says Max has brought in new customers that wouldn't have shopped at the dealership otherwise. The lovable amphibian got its start with the Maryland dealership in 1984, when Dave Wilson, who is now the dealership's president and CEO, exclaimed, "Everybody would love to have a frog!" during a brainstorming session. Since then, The Frog has appeared in commercials, on the hoods of cars in the lot and customers’ hands when they purchase a vehicle (that's right — everyone who buys a car gets to take home a frog too!). If there’s anything Mr. Nice Guy, Max and The Frog can teach us, it's that the most successful mascots represent a personal connection to the dealership's leaders. When creating a mascot, the personal element is key, because consumers can then relate to the dealer as a person, not just an impersonal entity. And when that happens, guess what? Consumers begin to trust your dealership more. And then they begin to get curious and want to know more. And then you have the opportunity to engage them by letting them pet your dog or stopping them in their cars and giving them money or by sending them "Happy Birthday" videos! And then they buy cars. It's amazing what a mascot can do. P.S. Got a mascot you're proud of? We want to hear about it! Tweet us at @855Callbright. So our sales guys like talking about call tracking. (Go figure.) They eat, breathe and live call tracking. (At least they make it seem that way.) So we snagged one of 'em and convinced him to answer your burning questions about call tracking. Everyone, meet Geoff. Q: First things first. What's your background in the call tracking industry? A: I’ve been in the call tracking industry for over seven years, primarily in various sales and support roles. A: When I started working for Callbright in June of 2007. I knew that companies recorded calls, but I had no idea of how much information could be gathered from a phone call. Q: What's different about call tracking today versus 10 years ago? A: A lot has changed in the past 10 years. Call tracking used to just count how many calls each ad source was generating. Now Callbright offers total call management — we not only track calls, but we record them and even integrate the calls with multiple CRM applications. We can also track and record outbound phone activity and immediately connect salespeople with customers who have submitted Internet leads. Our newest addition is our Call Rescue service, where we listen to customer calls and inform them of a missed opportunity. This gives them the chance to try and recover a sale, thereby closing a huge profit leak. We really help our customers manage all aspects of their call management. Q: What is one thing businesses are surprised to learn about call tracking? A: They are always surprised how much room they have to improve in just handling incoming calls and routing them to the proper place. Q: What is the most important call metric businesses should track? A: How many of your calls actually convert into sales and how much money they're generating. Q: What is the number-one call tracking don’t? A: Don’t kid yourself that you know what’s working and what’s not — put a number on everything! Q: What should businesses look for in a call tracking provider? A: Make sure that your provider is an actual call tracking company that can develop new products based on customer feedback. Many companies offer call tracking from third-party providers. Callbright develops and supports our own product with our workers here in the USA. A: Over the last few years, there's been a lot of focus on the importance of the Internet in the research and sales process. Many people had de-emphasized the importance of phone calls. Now, with so many people using mobile devices to conduct business, the ease of clicking a number to make a phone call has increased the importance of the phone call in the sales process. That's all for now, folks, but if you have more questions, tweet them to us at @855Callbright. Today is the 106th anniversary of Ford’s Model T, a special car that changed the automobile industry forever. Not only did it introduce new mass-production methods, the Model T also changed the notion of the automobile entirely, shifting it from a luxury item only the rich could afford to a necessity available for everyone. The exciting features of the Model T are what made it so special. Embracing these same qualities can turn your dealership into a success story as well. In his autobiography, Henry Ford fondly recalls announcing that he would make his car available to the customer in “any color he wants, so long as it is black.” While this plan may not have been the most accommodating, Ford was a shrewd planner and knew exactly how he wanted his product to be treated. While only offering vehicles in one color is somewhat extreme, you can still learn from Ford’s strategy. Find what makes your dealership special and use it to stand out from the dealership next door (and the one next to that). Maybe you offer a fancy gift with every new car purchase. Maybe all of your big trucks come with trucker hats. Or maybe all your cars are black. Whatever it is, find your niche and stick to it! Although you might not have guessed it from the color options that Ford offered (or lack thereof), he was actually pretty comfortable with the flexibility in how his cars were used. A large part of the American economy during the Model T’s reign was agricultural, so many of Ford’s customers saw the vehicle as an opportunity for better farming. Customers converted the Model T into a tractor so often that some companies sold prefab kits to help them reconfigure their cars. That means it’s time to start selling tractors at your dealership! Well, maybe not, but you should still customize your vehicles. If a customer is ready to make a purchase, but really wants tinted windows, offer to take care of the tinting yourself! And utilize your service center as much as you can. Those guys know what they’re doing, so why not give them a chance to soup up some cars? They might just end up helping you find your marketing niche! Henry Ford wanted to be sure any man could own a car and enjoy the open road with his family. As a result of this noble goal, Ford would pass along the savings from his innovative assembly methods to his customers by continuously lowering the price of the car in its years of production. Ford had a real passion for cars and people. Your business exists to sell cars to people, so make sure you remember you’re selling cars to people. These are people with lives, families and jobs. If your sales team can keep that in mind, they can better connect with them, build rapport and, yes, make the sale. The Model T changed the automotive industry forever and its success has taught those in the industry many lessons. To take a look at how far the industry has come, check out this infographic about the car dealerships of today.